The Arab Spring has yielded a bumper crop of dethroned leaders. The latest bad apple to fall from the tree is Muammar Gaddafi. Libya’s autocratic leader came into power forty-two years ago in 1969. Graphic blood-stained and scantily-clad images displaying the longstanding leader dead with a bullet to the head evidenced that according to NATO and his Libyan countrymen, he had long since overstayed his welcome. Libyan protests began in February the day after Gaddafi vocalized his anti-Israel sentiment and eight months later the dictator winds up dead. Is this a coincidence or is there a Biblical lesson to be gleaned by those bent on cursing Israel? Genesis 12:3 warns those that curse the Jews invoke divine judgment upon themselves. 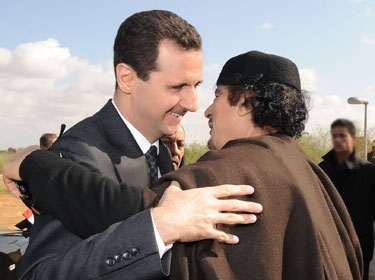 The graphic Gaddafi images presently circulating around the globe should send a strong signal across the Mediterranean pond to Syria’s president Bashar Assad to beware of a similar fate. Assad has been undergoing a comparable crisis of his own since protests began on January 16, 2011 and uprisings commenced on March 15, 2011. On October 4, 2011 the Syrian leader threatened that if NATO intervened in his country similar to Libya, then Tel Aviv would be struck by Syrian and Hezbollah missiles within six-hours. This threat pales Gaddafi’s February remarks in comparison. Threats between Syria and Israel are commonplace, so there is a general tendency in the mainstream media to chalk such rhetoric off as mere rumors of war. However, with the instability created by the Arab Spring and the deaths or departures of those listed below, it appears to be time for the liberal pundits to come to grips with the stage-setting in the Middle East for a potentially imminent war. Tunisian President – Zine al Abedine Ben Ali was ousted January 14, 2011. Egyptian President – Hosni Mubarak resigned February 11, 2011. Who can forget the images of him on trial with his two sons caged in a Cairo courtroom lying on a gurney with an I.V. in his arm? Certainly these images didn’t set well in the Syrian capital of Damascus to a regime struggling to maintain power. Al-Qaeda – Osama Bin Laden was killed on May 1, 2011. Al-Qaeda – Terrorist leader Anwar al-Awlaki was killed in a drone attack on September 30, 2011 in Yemen. Yemen – President Ali Abdullah Saleh tendered his resignation in April of 2011, but is still negotiating the terms of his departure. Libya – Muammar Gaddafi takes a bullet above the brow on October 20, 2011. Gaddafi had become the billion-dollar man to the Obama administration. With the war in Iraq costing approximately $1-trillion, and the Afghanistan war nearing the $500-billion mark, the U.S. war with Libya had surpassed the $1-billion price-tag for U.S. taxpayers. The NATO led war commencing on March 19, 2011 that President Obama said would only last a short while, was threatening to become an embarrassment if it was prolonged much longer. These bold statements coupled with Obama’s approval of Mubarak’s resignation and the death of the Al-Qaeda leaders, signals that Mideast regime changes and wanted dead-or-alive posters are the order of the day in Washington. In light of Gaddafi’s death in Libya, President Assad has to be concerned that he may be the next billion-dollar Arab leader. Syrian President Assad’s recent intimidations toward Israel were not idol threats but were prompted by his genuine concern that NATO, at the encouragement of the member state of Turkey, might intervene in Syria like it did in Libya. The Syrian revolts have led to a deluge of refugees crossing the border between Syria into Turkey. From Turkey’s perspective, something, perhaps a regime change, must happen soon to squelch the oppression of the Syrian revolutionaries by the Assad regime. What Does the Bible Predict Will Happen Next? What happens next in Libya and Syria? Can the future of these two countries be known? CNN host Piers Morgan interviewed the esteemed news broadcaster Dan Rather on the day of Gaddafi’s death and asked him what the future holds for Libya in light of the pending regime change. Dan Rather quoted that living life around a crystal ball causes people to step on broken glass. In essence he avoided answering the question and insinuated that the future cannot be known. I disagree with Dan Rather; there are some future events that can be known according to Isaiah 46:9-10 and elsewhere. In fact under the banner of ancient “Put,” Libya is listed in a Bible prophecy inscribed in Ezekiel 38. The Ezekiel prophecy, commonly called the Gog of Magog invasion, involves a Russian-Iranian led coalition consisting of nine populations that attempt to destroy Israel in pursuit of great plunder. Many eschatologists believe this invasion could happen soon. If the eschatologists are right and Ezekiel’s prophecy is about to be fulfilled, will the next regime also be Anti-Semitic? The fact that a new regime will require some time to form in the vacuum created by Gaddafi’s death makes it doubtful that the Ezekiel 38 invasion is the next prophecy to be watching for. Perhaps prophecies like Isaiah 17 and Psalm 83 involving Syria may be more imminent. Isaiah predicts the destruction of Damascus and Psalm 83 lists Syria as a member of an Arab confederacy predicted to attack the Jewish state in order to capture the land of Israel. If NATO decides to intervene in Syria, Bashar Assad may make good on his recent threats to attack Tel Aviv swiftly to stave off a pending NATO invasion. Certainly Syria’s president is not interested in taking a bullet to the head like Gaddafi did only a few months after the NATO led charge into Libya. However, unlike Libya, Syria has a military ally in Iran that appears willing to fight alongside Syria and has threatened to wipe Israel off of the map. It is all getting very dangerous in the Holy Land. The Gaddafi regime may not be the last Arab government toppled and he may not be the final Muslim leader assassinated. If Bashar Assad attacks Tel Aviv, he may lose his head like his former ally Saddam Hussein of Iraq did several years ago. Or, even worse for him and many of his countrymen, Israel may discharge a nuclear device in Damascus and incinerate a multitude of Syrians in retaliation. Perhaps eschatologists should be looking at the prophecies in Isaiah 17 more closely in light of all the above. My new book Revelation Road – Once Upon an End Time, presents an exhaustive verse-by-verse study of Isaiah 17 and is due out by December, 2011. It will be available for presales soon at www.prophecydepot.com. Hopefully the Damascus study included in the book will be regarded with pending prophecy rather than a history lesson. Keep your eye on Mideast events meanwhile, as Mideast war may be looming on the horizon.